The trash bag flapped around me in the wind as I squinted my eyes to see through the dark. Where was the starting line? Not too far away, I could hear the reverberating voice over the loudspeaker—we must be close! Suddenly, my sisters and I turned the corner of a low, concrete building and were greeted by a crowded mass of runners huddled around heat lamps. Welcome to 60 degrees in Arizona at 5:30 in the morning! 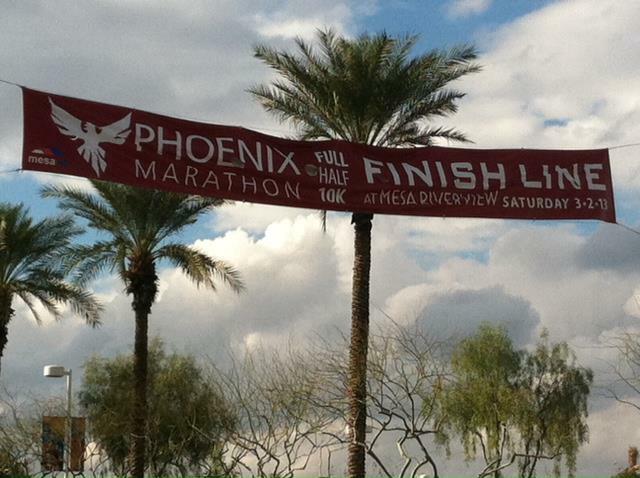 We entered the throng of runners, ready to race the Phoenix Half Marathon this past Saturday, March 1st. My sisters and I, coming from much cooler climates, had to chuckle a bit about the huddled runners. Coming from the sub-zero long runs in Wisconsin, the balmy 60 degrees felt amazing—even the threat of rain during the race didn’t scare me. In fact, I thought it might help me; I was afraid 60 degrees would feel too warm! The garbage bag “dresses” we wore proved useful. The slight wind and misty weather turned out to be a little chilly after standing outside for 15 minutes. Even we were glad for the heating lamps that we, and all the others, corralled around as we waiting to line up for the start of the race. 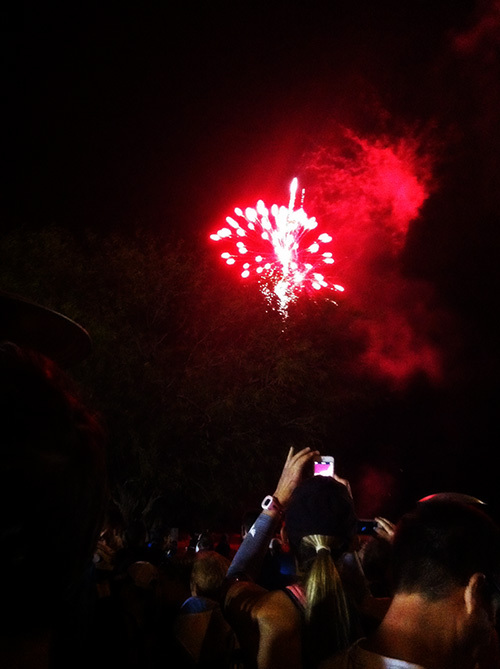 It wasn’t long before the Star Spangled Banner was being sung; beautiful voices echoed over us all, and a spark of excitement ran through us all as fireworks went off. What a way to get the adrenaline going! We headed for the start line. At 6:28am, the rain started falling. At 6:30 on the dot, the starting gun went off. Five minutes into the rainy run, I clenched and unclenched my chilly fingers and wondered how quickly they would warm up with the rain. But just five minutes later, the rain had stopped and was replaced with an intermittent mist. 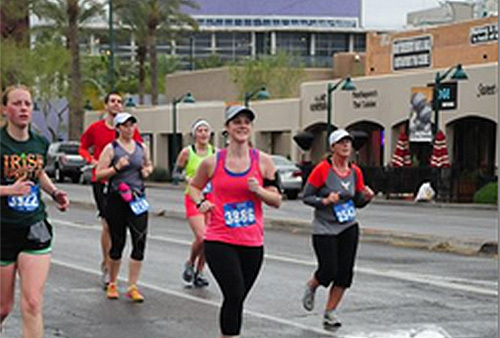 It hadn’t rained in 80 days or so in Arizona, and although we had a few showers during our half marathon, it turned out not to be the water-logged run we all expected. 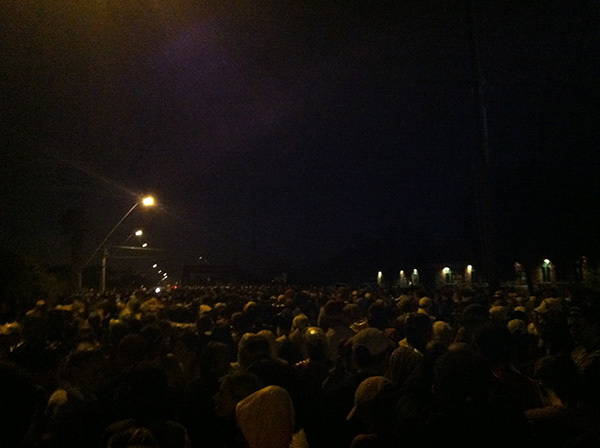 We ran down residential streets, somewhat tightly packed. I got stuck behind some slower runners and walkers a handful of times. Frustrating, but easy enough to quickly find a spot to slide around. I took in the humble homes; the desert landscaping right with cacti and stones; the groves of lemon and orange trees, which completely but happily surprised me. The birds chirped as the sun came up and lit our way. Clif gel shots, licorice, bananas and oranges were all offered along the way by smiling volunteers. I grabbed a Clif shot to try on a different run, but gobbled down my trusty Shot Blox gummies as needed. I was amazed at how well the runners were supported, and thanked the volunteers and numerous policemen (and the few cheering fans who braved the cruddy weather) when I could spare the smile and breath. Soon, I was nearing the 10-mile marker. I felt great still, and decided to kick it up a notch. I had been sticking close to my 10:30 minutes per mile goal, but I wondered how much further I could take it. I hadn’t been planning to race this half marathon or try for a goal time, but that itch surfaced and the push began. This was it. The end was getting close, and I stared out at the mountains in the distance. Glad to finally glimpse some Arizona scenery, I spared the seconds to slow down and capture the moment. But not for long. I opened up my stride and continued the downward descent to the finish line. I sprinted past people left, right, dodging around like a little kid running around his parents’ legs. I smiled huge, feeling so strong and fast, hearing my older sister cheering for me—“Go Mandy!”—as I stared down the fast-approaching finish line. I glanced back to my right to see a male swiftly approaching at the end of his 26.2-mile run. I sailed over the finish line at nearly the same moment as him, and grinned to myself. At least when I got home, I could tell everyone I had tied with the winner of the Phoenix Marathon. 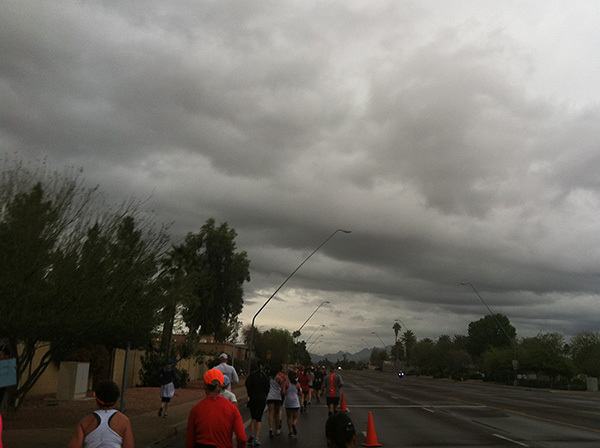 I’ve been keeping a close eye on the weather for the Phoenix Half Marathon on Saturday morning. They’ve been predicting rain, and I keep waiting for that to magically go away—but just a few days out now, there’s a pretty good chance we’ll be slogging through 13 miles in the rain. Which led me to start seriously thinking: What do you wear for a race in the rain? 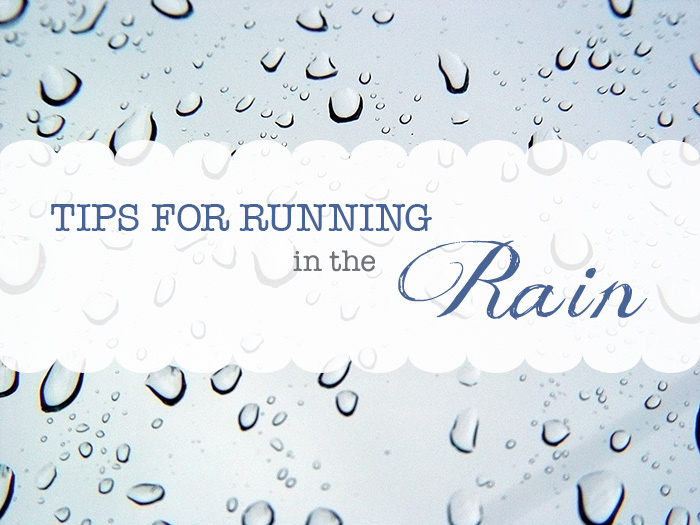 Here are some tips I’ve collected (from my gracious, knowledgeable running club friends) on how to prepare for and run in the rain. I hope they help you, whether you’re running the race this weekend, or face a rainy run in the future! Mentally prepare yourself: You will be running in the rain, and you will get wet. Pack dry clothes to change in to immediately after the race, so you aren’t freezing post-run. If you prefer to run with music on an iPod, your phone, or other electronic device, find a way to waterproof it. Sandwich baggies, plastic wrap, whatever you can MacGyver up. If you can forego your tunes, do so—that’s one less thing to worry about on race day. 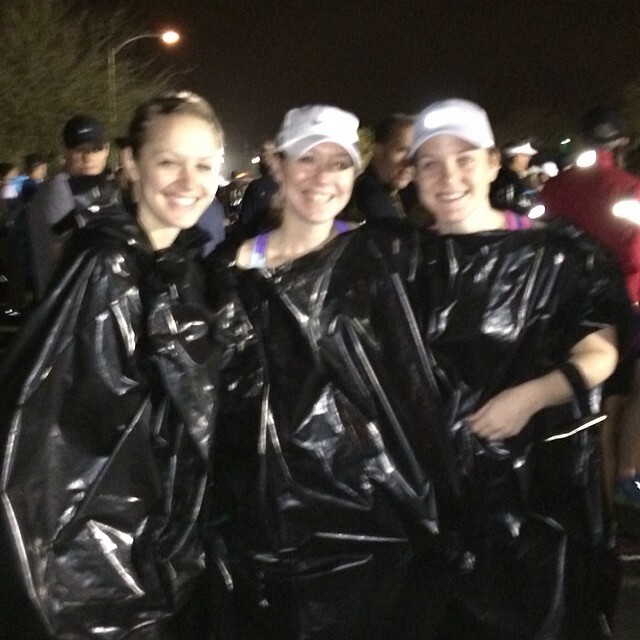 Use a poncho, or even just a large (clean) garbage bag, to keep you warm and dry while you wait for the race to start. Wear a hat. The brim will keep the water from streaming down your face and into your eyes. Wear moisture-wicking clothes. Yeah, there will be too much moisture to wick away, but it won’t hold on to it and weigh you down like other materials. Plus, it will help keep some chafing away. Use Vaseline/Body Glide on likely chafing spots: Legs, arm pits, bra straps, etc. Don’t forego your water stops. Just because you’ll be soaked, doesn’t mean you don’t need to stay hydrated! Embrace it! We don’t often go out running in the rain. Enjoy the feeling; pretend you’re a kid out running around in the puddles again. Change into your dry clothes that you so thoughtfully packed up before the race. Hopefully this includes some dry socks & shoes. Refuel yourself with something to drink—again, that’s not just rainwater you’re soaked in, it’s surely sweat, too. How to describe this week’s workouts? Surprising. Circular. Snowy. Tiring. Torture. But… Positive. I’ve had hip & ITBS trouble in the past, so I’m adding yoga into my weekly routine to help keep me flexible and injury-free. I did this quick 25-minute video I found on runnersworld.com. I typically don’t like doing yoga at home (I get bored, easily distracted) but this “Class 1: Essential Yoga” video was quicker-paced than a traditional yoga video (and none of that zen music in the background to make you feel sleepy). I was a little sore the next day, but in a good way—my shoulders could feel it, so I’m glad they’re getting some strength work from the downward dogs! On the treadmill. Pretty boring, but checked it off the list. I did an interval workout on the treadmill that I—gasp—actually enjoyed! I wrote more about it here, but it was a good workout and I felt strong. I switched things up on Thursday and ran on an indoor track with my friend Liz. One mile = 8 laps on the track. Sooo, 40 laps. While I enjoyed having a friend for company, I have to say I really didn’t like running on the indoor track, which surprised me. I thought the notion of moving would be better than the treadmill, but I found I couldn’t really “zone out” at all, and it just wasn’t relaxing. We ran between a 10:30-11:15 pace, I think, but it still felt like it wasn’t that easy to me. Maybe because of the speedwork on Wednesday? Also, probably because the track is just a thin layer of rubber (or whatever it’s made of) on concrete, my knees were kind of bugging me. After 2 miles, I had to stop to stretch, and it’d help for a bit, but then my knees would start getting achy and I’d have to stop again. I tried not to let this worry me, but with the ITBS issues in the past, it was lurking in the back of my mind. I actually stopped ¼ mile early, just ‘cause I didn’t think it was worth pushing it. Let me preface this with: I try to stay optimistic, and find things to be positive about, even in bad times. But, if I thought last Saturday was rough, yesterday’s run was ten times worse. I don’t even know what descriptors to use for it that don’t include swear words. All kinds of names ran through my head while I ran it: I could say it was the polar vortex edition of water boarding, perhaps. Whatever, I’ll just say—it was mental torture and physically exhausting. Sounds like a blast, huh? When we started at 7am, there was probably 2-3 inches of fresh snow on the roads, sidewalks, everywhere…and no shoveling or plowing to make a way for us. 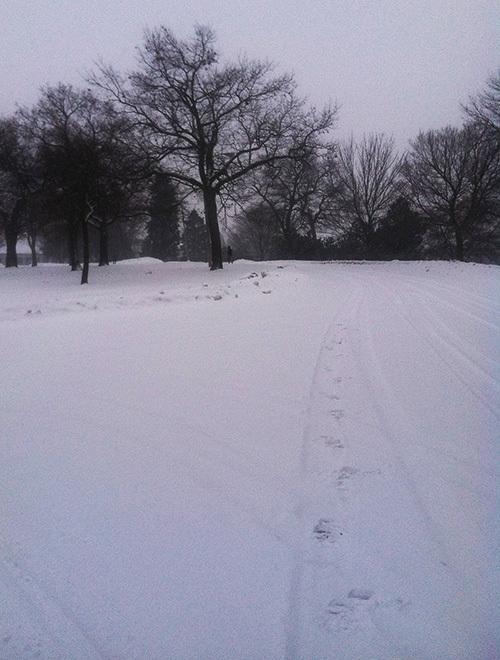 We just ran through the snow and blazed our own trail—for pretty much the entire 9 miles. It was a little warmer this weekend than the past, but running north there was still a good bit of wind to battle. In that wind were tiny, abrasive snowflakes that pelted your face. I’m glad I was able to get a microderm facial while I ran, at least. The snow would melt on my face, which caused the hood I had on to start chafing my cheeks (!!!) and then, the melted water would re-freeze in my eyebrows so there were ice chunks in them. Beautiful. Actually, now that I reread that and how ridiculous it was, I am laughing to myself. Does that make me kind of…nuts? At just 3.5 miles into the run, I was ready to quit. I was, embarrassingly, also ready to cry. On top of everything above, I was having trouble breathing (guess I should have taken my inhaler beforehand, with the cold air). I just wanted to QUIT. Thank goodness my friends June and Patty were running with me. I didn’t even say aloud that I wanted to quit, because I knew they wouldn’t let me. They just kept checking on me, and literally cheered for me the whole way we ran, telling me to keep going and that we would make it just fine. I don’t know what I would have done without them! That’s what running clubs (and friends) are for: When you think you can’t, when you know you can’t… They show you the way to “can,” cheer you on, and help you get there. So that’s what we did. We kept going, and we ended up running a little over 9 miles, when all was said and done. They showed me I could do it, after all. What’s the toughest run (or workout) you’ve ever done? I have to say, I have had a few tough runs and races in my life, but Saturday’s the worst I have had in a LONG time. I’m proud of myself for getting through it. It’s been settled: Sister Runcation 2014, here we come. A little sandier. And maybe…a tad prickly. I can’t wait to cross that finish line! That’s right: My sisters and I are going to Phoenix, Arizona, to run the BMO Harris Bank Phoenix Half Marathon on Saturday, March 1st. Woohoo! Why Arizona? My friend, Kelly, told me that Arizona is great in February-March, because it’s warmer, but not humid. Last year, we ran a race in Florida and it was unbelievably humid (= torture), so we didn’t want to make that mistake again this year. We thought it’d be a fun change of pace to escape our frigid homes for some warm & sunny desert scenery. We’re all signed up, our flights are booked, and we’re on the hunt for a hotel. 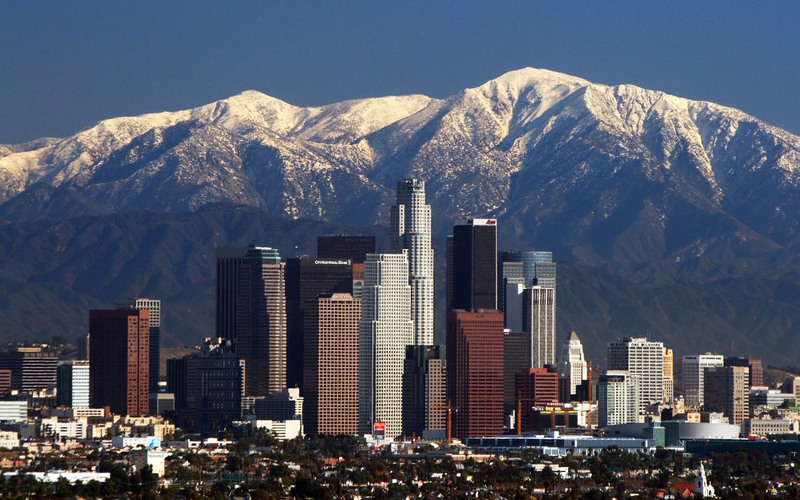 We’re stumped so far on where to stay and what to do while we’re there. Any suggestions? 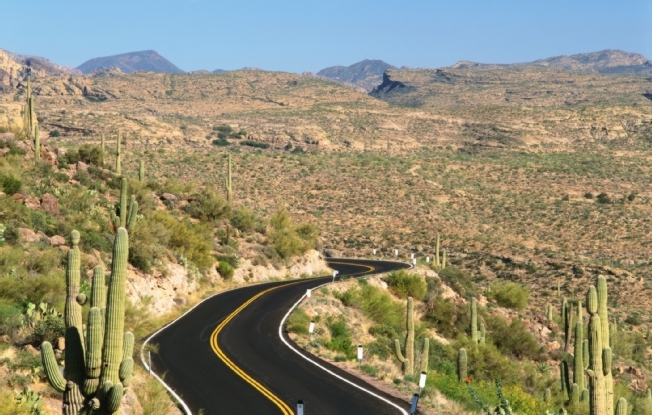 Have you ever been to Arizona? What do you think we should do there? Where would you love to escape to and run a race? I wouldn’t mind escaping to Hawaii or some other tropical island to run right about now! P.S. If you want to sign up, it’s $80 until the 15th, then the price goes up again. 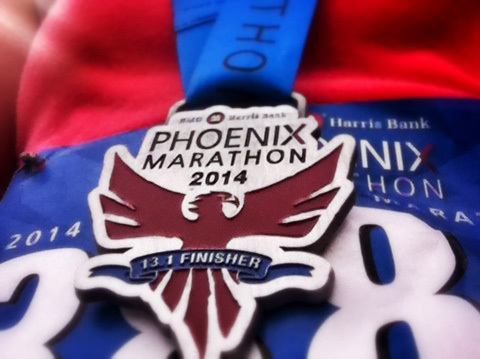 You can save $10 off the Phoenix Marathon (or half marathon) by using discount code FRIENDS10.